At less than 4 bucks, they aren’t such a bad thing to be hoarding. I’ve hoarded way worse..just ask my husband. Anyway, I’ve been putting them in all kinds of places. 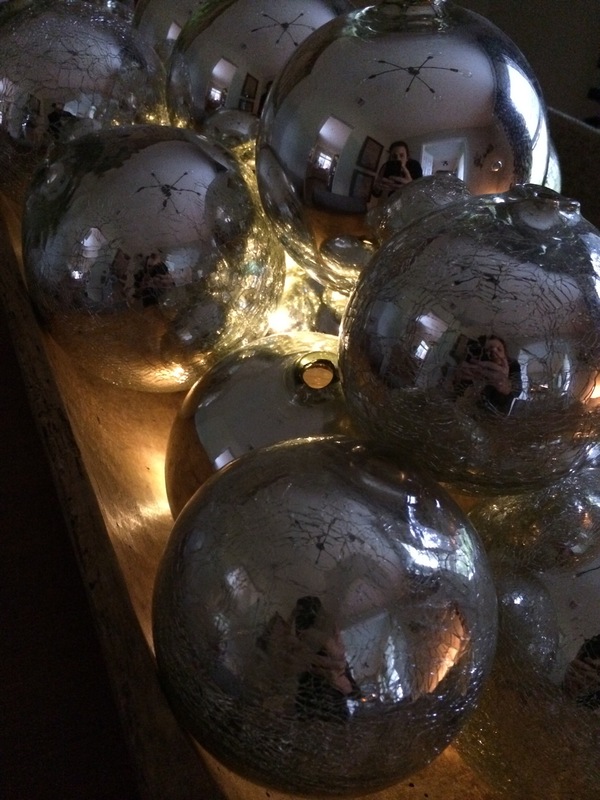 Like here, in these silver orbs that I have on my dining room table. It’s nice to have a little glowing, warm light in that room without having to turn on the chandelier. And now that it gets dark at 4pm, that’s kinda handy. 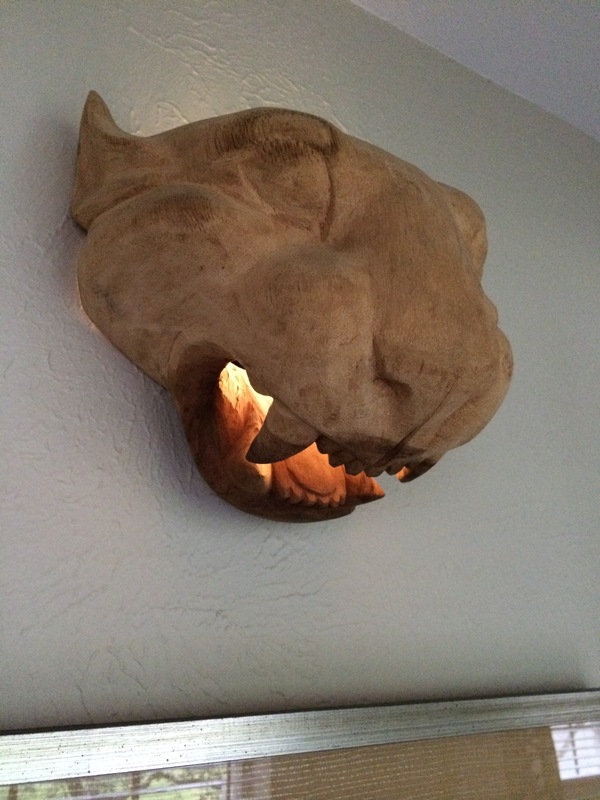 I also stuck them in this wooden lioness’ mouth. Lights up my otherwise dark entry way where she lives. And, it makes me happy to see her little fangs glowing. Get you some! See what you can do to brighten up your place. What fun that was! 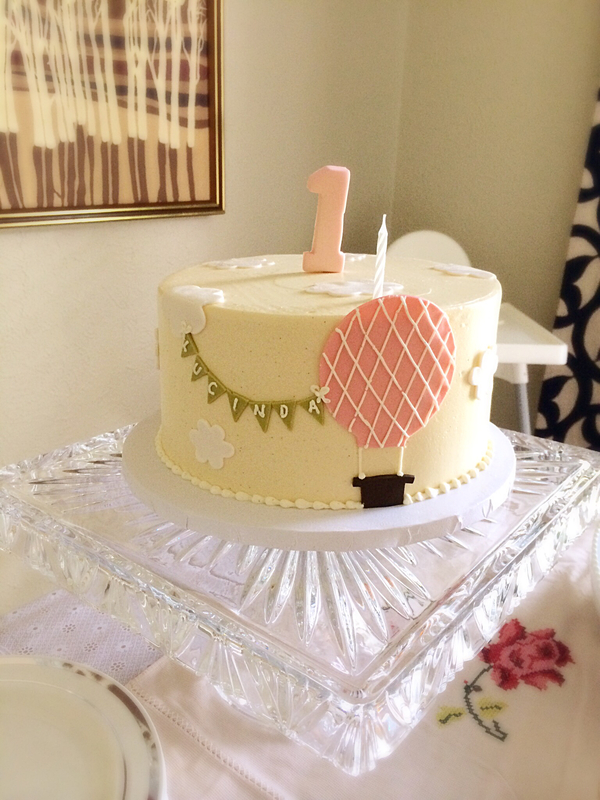 My daughter had her first birthday a couple of weeks back and we threw a little party for her. In my brain, when you are on a pretty strict budget (like I always am) I try to focus on three things and let the rest fall into place. The three things change with every event I do depending on the event, theme, time etc. For Little’s birthday, I chose to focus on the invite, the food, and a few special decorations. 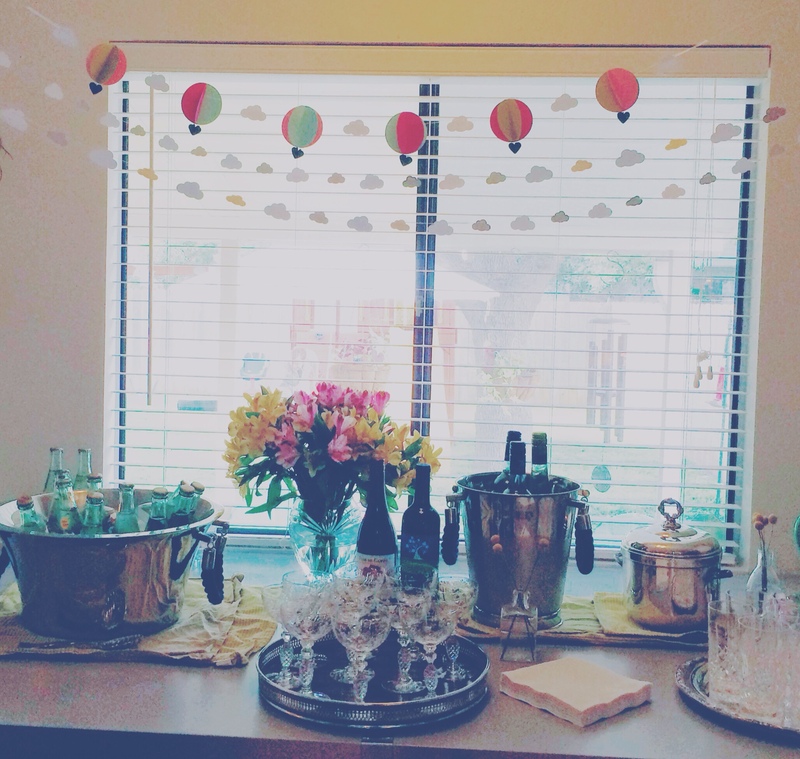 The rest was pretty simple… Flowers here and there, a couple of streamers outside, booze, booze and more booze. INVITE : This gorgeous card screamed out to me in stereo and satisfied my obsession with chartreuse. Speaking of chartreuse, have you seen my couch? It’s chartreuse..I’m on a kick, don’t ask. I am sure my husband is gagging. I also have chartreuse bed linens, art and maybe a throw pillow or 6 that are chartreuse. Anyway – here is a link to the adorable shop I got the invites from on Etsy called : Simplicity Papers Go check out her stuff – it’s so sweet, clean and pretty. Shop owner is communicative, friendly and turned my things around VERY quickly. 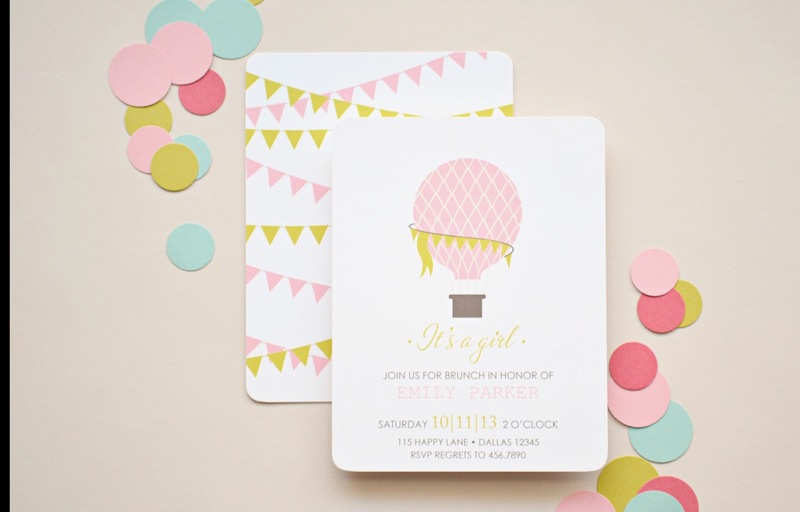 She did a whole ‘nother set of invites for me after this that turned out ah-mazing. (more on that party later). 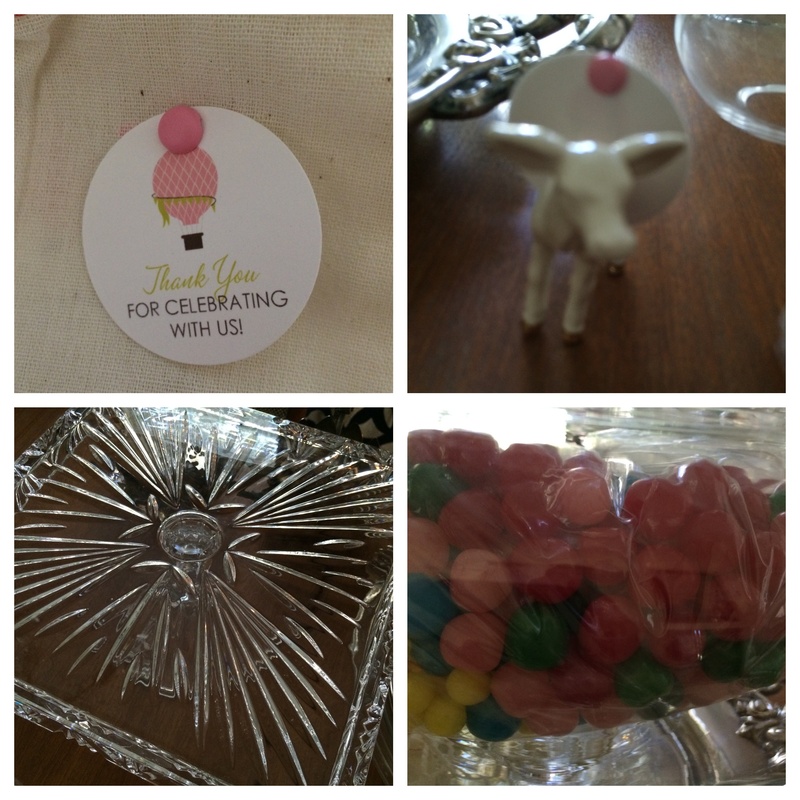 FOOD : Entry way favor table. Inside the big bowls, I had little scoops for guests to scoop their own little goodies into little muslin bags that I attached a thank you card to that matched the invite from Simplicity Papers. I used old time-y candy because…yum. And, they are pretty. 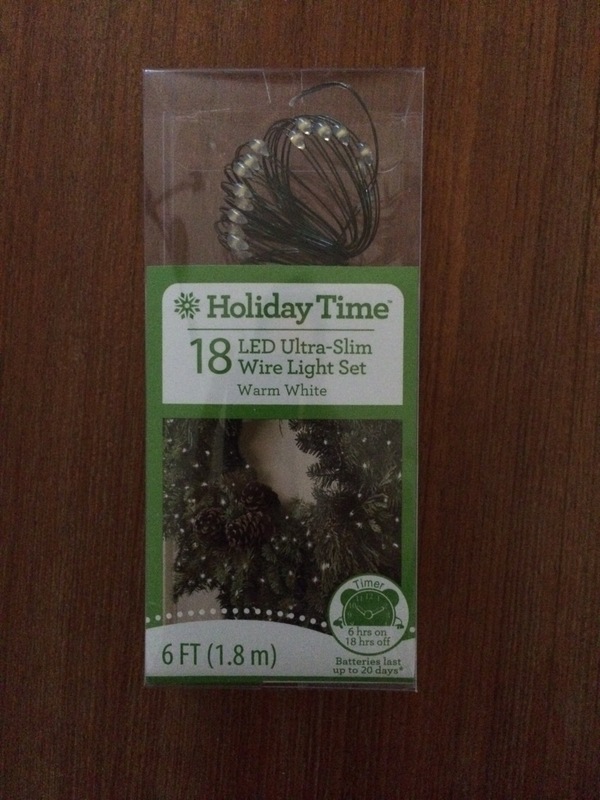 And, the candy bowls will actually be great to use at terrariums..you know..for when I feel like doing a little indoor gardening (what? no). 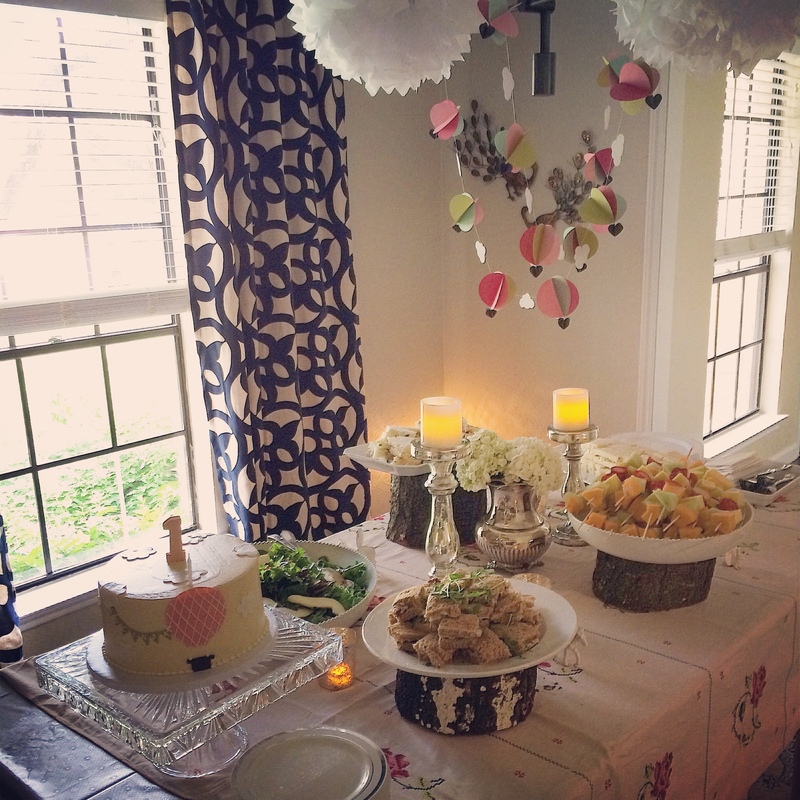 MORE FOOD : This is the buffet table I set up on our dining room table. Please notice the darling garlands that I had custom-made to match the invite (ohmygod, I am THAT PERSON) from another awesome Etsy shop called Young Hearts Love. She also was friendly, dependable, communicative and a pleasure to work with. Her little garlands are now decorating my daughter’s room, and every time I go in there I feel happy. Give her some Etsy love, will ya? In addition to cake, we served a big green salad with goat cheese, pomegranate seeds, sunflower seeds and sliced pears with a lemon vinaigrette dressing. Three different kinds of tea sandwiches – dill cream cheese and cucumber (because, you can’t have tea sandwiches and not include a cucumber), smoked turkey with rocket, cranberries and toasted pecans. And, a roasted chicken salad with celery. And melon skewers with strawberries. And yes, those are LED candles. Yall. I gots kids at this thang, and paper poufs hanging above. Don’t hate. Below : Le Bar. Because, you know. It’s really for the adults at one year old’s party. And maybe the mom because she might be someone who likes to have parties, and celebrate, and buy too much chartreuse. Ahem. 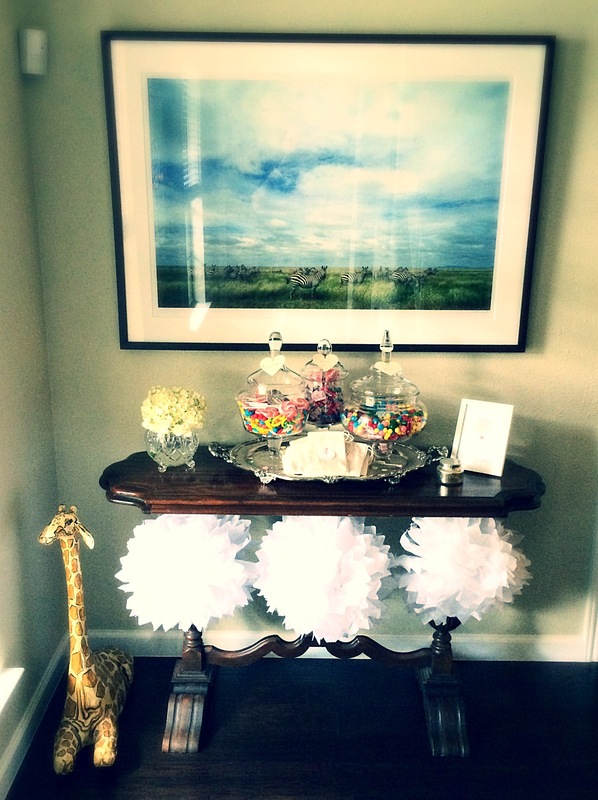 Notice more garland, and this time I used Young Hearts Love little metallic clouds. So sweet, they make my teeth hurt. It was a real b. to get that thing centered though – note to self, STOP EYEBALLING everything. Use a tape measure once in a while. And last but not least, the CAKE. This was made by Olga over at Polkadots Cupcake Factory here in Austin. They did our wedding cakes and I just had to have them do Little’s birthday cake. Olga matched the invite perfectly. Red velvet with cream cheese icing… It was so so so so good. Side note – those of you that follow me on Facebook or Instagram, you might recognize the wood pieces on the table. I had my generous brother-in-law cut this big log from a tree my neighbor threw out into varying heights to use as trivets. I wanted to create some depth and interest on the table. I think they did just the trick. No? Thanks for reading! I kinda feel like you all celebrated with us a bit, now. Awe. PS Coming up next : a LOVE party! Some little body is celebrating a birthday!